This is a rare trial card from the printers, Blades East and Blades. 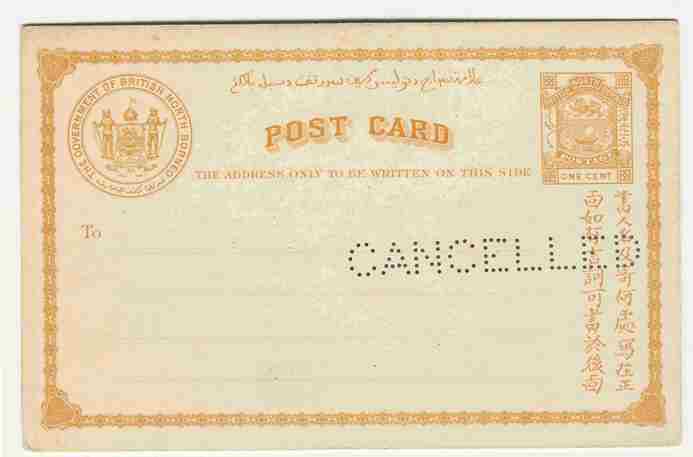 I have a similar card with the same CANCELLED perforation. Mine is the 1c card but printed in pinkish red. On the reverse is another print of the one cent in issued colour (orange-brown) but with an indelible pencil ring around the decorative border at the foot of the card highlighting that this is printed in a lighter shade than the other three sides. It also has some dirt marks from the print shop floor and is obviously a printer's sample. This and many other interesting Postal Stationery items from North Borneo and our other countries, Labuan, Sarawak and Brunei will be shown at the Annual Weekend and AGM at the Heythrop Hotel Chipping Norton 16-19th October 2009. Details on the website.